I've added a Flickr link to some photos of Clapton Orient's old stadium just off the Lea Bridge Road. Before playing here they were based in the Millfields area and also had a short stint at Wembley. Could you please help me in tracing a former player around this time period my Grandmother claims her father played for Clapton orient his name was Charlie Vogel. Do you have any info on him? My husbands Grandfather says his father played for Clapton Orient and we are desperate to find a picture of him to give him as he hasnt got any of his father. his name was William Thomas Beckinsdale he changed his surname to veal so it ma be under William Thoms Veal. Look forward to hearing from you with any information. 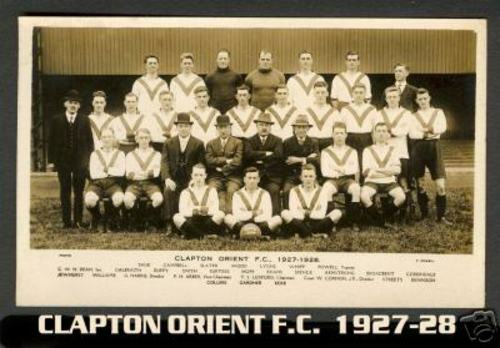 My father tells me that my Grandfather played for Clapton Orient maybe around the 1920's. His name was William Frederick Hamilton. Any information on my grandfather would be appreciated. Thank you! Nobody called Hamilton is listed in Orient FC - A Pictorial History by Kaufmann and Ravenhill having played in the League. I guess not all players made it into the first team. I have a similar query but pre 1914. I am looking for William Hunter who played for ECFC 1914 but I believe he moved there from Clapton. Could anyone have any details on a player called Harry Jenkins who played just before the secon world way and also played at Leyton Orient when they moved.I also believe that his good friend Stan Smith also played for them. would you know of any players surnamed Dean, who may have played for Clapton Orient pre WW2? Following up on my previous message on July 4th 2013 I understand my father Harry Jenkins played for the reserves as a right winger he mentioned he had made his first appearance at Fratton Park and scored his first goal at Wimbledon if anyone give me any information would be obliged. Your request for info on a Jack BARR playing for Clapton Orient. I do have a JOHN Barr listed playing for Clapton Orient first team, but afraid no pictures of him as he was mostly a reserve player with a few first team appearances. AM RESEARCHING CAREER OF BERT RINGROSE WHO PLAYED FOR CLAPTON ORIENT DURING SEASON 1945/46 AND WONDER IF THERE IS DETAIL OF WHICH MATCHES HE PLAYED. I am researching the career of Bert Ringrose who played for Clapton Orient during season 1945/46 and wish to find out what matches he played in. Many thanks if you can help. My previous communication should have referred to BERT RINGROSE. Hi all, do you happen to have anything on David or Emlyn Evans around the 20s/30s? Thanks! !